Winnall Moors Nature Reserve less than half a mile away from the busy city centre. Winchester is fortunate, there are two Nature Reserves in close proximity to the city, this one - Winnall Moors and the other is St Catherine's Hill. This is such a pretty place, a haven for wild life both flora and fauna. 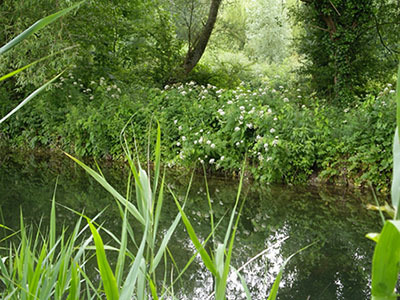 The River Itchen dances through the reserve like sparkling silver stream fairies on a sunny day. Serene, tranquil, an escape from the cares of life. Ahhh!!!! www.geograph.com © Copyright Peter Jordan and licensed for reuse under this Creative Commons Licence. Wild flowers in spring and summer sprinkle the grass with colour. Waterfowl sail softly or dart through the streams in pursuit of their own fare and happiness. Birds swirl in the sky, or keep secret their nests, flitting from bush and tree. Buttterflies flutter by dressed in lovely summer colours. Fish swim among the weeds in the stream. It is the southern end of the reserve that has a circular path and boardwalk. All pushchair and wheelchair friendly. About a mile long, but take your time, peep here and there, stop and watch. Drink in the tranquility. No wet feet! Winnall Moors Reserve is run by the Hampshire and Isle of Wight Wildlife Trust who run in the region of fifty such reserves all over the two counties. There is never one that far away!! Not all wetlands, there are the chalk grasslands of the downs, woodlands as well as coastal reserves. They run the other one in Winchester as well, St Catherine's Hill. 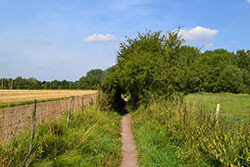 The 34 mile long footpath from Winchester Cathedral to Farnham in Surrey, St Swithun's Way, passes Winnall Moors Nature Reserve, it would make a good stop along the way. Best time to visit is during May, June and July.